On Saturday, January 12, 2019, at approximately 4:50 AM, officers with the Colorado Springs Police Department(CSPD) contacted a suspicious male party in a stolen vehicle parked in the parking lot of Elevate Apartments, located in the 400 block of Crestone Lane. During the contact, the male party began struggling with officers and shots were fired. The suspect was armed with a hatchet. 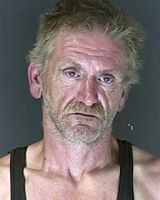 The suspect has been identified as Bill Gerald Akes, DOB: 07/01/70. The cause and manner of death will be determined by the Coroner's Office once they have all the information to make a ruling. The Coroners Office is trying to contact Katie Thomas Akes and she is asked to contact them at 719-390-2450. A mugshot of Akes is attached to this media release. The El Paso County Sheriff’s Office is the lead investigative agency for this incident. This is an ongoing investigation and information will be released as the investigation allows.